Megan takes on 2 nice bucks within days apart Thanksgiving week! This was Megan's first time back in the woods for over 2yrs. She took on a nice 8 pointer on Thanksgiving day (Nov. 23rd, 2017) in Northern Iredell County. The buck had a 17.5 inch spread and weighed in at 179lbs. His G2 was half broken off however this was her biggest buck that she has ever hunted. Then on Saturday Nov. 25th, 2017 she takes on another giant buck in West Rowan County. This buck was taken at 150yrs. This toad of buck was only a 7 pointer however much more mass than her first one. The buck had a spread of 18.5 inches and scoring around 125 weighed in around 238lbs. Megan ended up tagging out on this giant Rowan County buck!! 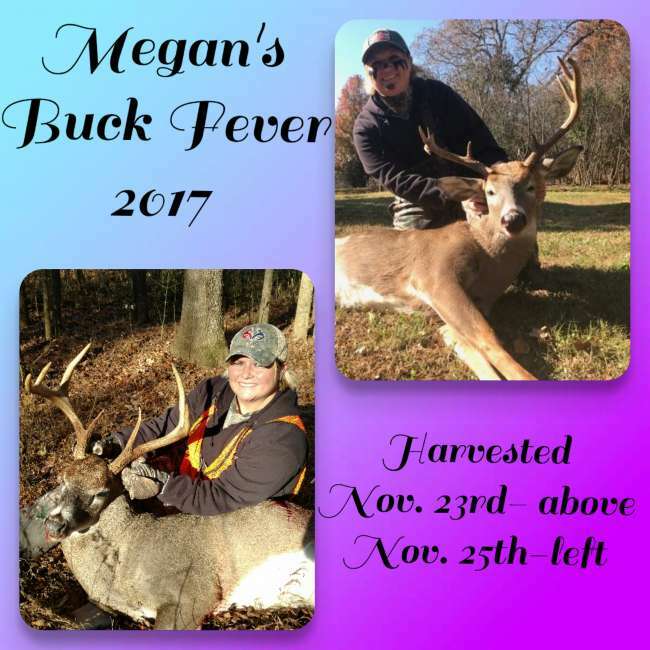 As you can tell Megan had an amazing Thanksgiving week harvesting 2 giant bucks for her area! !